I enjoyed Phantom Stranger under Dan DiDio, but then J. M. DeMatteis came on the title and delivered as good if not better on the (sadly mostly overlooked) series. In Justice League Dark Vol. 5: Paradise Lost, DeMatteis's first independent Dark trade, he takes over from Jeff Lemire (and artist Andres Guinaldo takes over for Mikel Janin), which seems to me a much tougher act to follow. DeMatteis doesn't present the Dark characters poorly, but the trade contains two "secret origin"-type stories, and neither improved on the character it profiled. The book lacks complexity at a time when comics need it all the more. DeMatteis's three-part origin of the Nightmare Nurse and two-part origin of Deadman each, in the broad strokes, come off tonally similar, in that both involve the focal hero ripped away from their life, some giant mystical threat wants to take advantage of this, and the Dark team members fight to get their friend back. The focus of each story is the story, in that DeMatteis doesn't hint at any side plots or storylines that might develop in Dark over time (notwithstanding the looming Convergence cancellation). In this way the stories come off as very one-note, essentially good guys versus large ghostly-or-mysterious bad guys, and so there's not much to feel involved in aside from the aforementioned "secret origins." What's revealed about Nightmare Nurse is that she's some kind of (vaguely defined) body-hopping demon who's been possessing the unwilling body of a woman named Alice Winter for centuries. Frankly, far more interesting would be if Nightmare Nurse really was a rogue demon who the Dark would decide, weighing the benefits against the cost, to actually continue stealing a young woman's life. Instead, the Nurse claims innocence all along, and in the end turns out to indeed be innocent, and Winter allows herself to be "repossessed" willingly. I've no grudge against a happy ending, but it takes DeMatteis three issues to basically reveal something not too shocking about Nightmare Nurse and then to return her to the status quo; I frankly liked the Nurse more when she was a mysterious, trash-talking mystic healer that we didn't know so much about. With Deadman, DeMatteis posits that Boston Brand is among special children trained in mysticism in Nanda Parbat and then made to forget, reminiscent of one of Donna Troy's origins, such that Brand's later resurrection as Deadman is more fate than accident. For me, this overcomplicates and also mitigates some of the better parts of Deadman's origins; in the superhero aesthetic, it works that Brand was a circus performer and a not-so-nice guy who, when killed and resurrected, gets the opportunity to atone for his past sins as a ghost. Bringing in the "chosen" schtick loses the "everyman" feel of Deadman (similar to Barry Allen getting struck by lightning). As well, DeMatteis's introduction of Deadman's advisor Brahma Dass entirely conflicts with Paul Jenkins's recent Deadman origin (via Rama Kushna) in DC Universe Presents; I gather this might have been explained away in DeMatteis's recent Secret Origins Deadman story, but that's an issue that sorely needed to be included here and wasn't. The book is highly overnarrated, too, especially the Deadman parts, with DeMatteis not seeming to trust the audience following a bit of nuance. Consider the fourth chapter, issue #33, where DeMatteis can't just show us Zatanna appearing sad while gazing at a photo of her parents, but also needs to have Deadman tell the audience she's sad and have Zatanna say aloud that she misses her parents. A page later, Deadman is suddenly transported from the House of Mystery to a frozen wasteland, and it's not enough for the scene to change and Deadman to exclaim "What the hell," but also DeMatteis has Deadman narrate that he's not where he was a moment ago. There are instances like this throughout where art, dialogue, and narration all do the same thing instead of one deferring to the others. Artist Andres Guinaldo succeeds in some of the book's monstrous creations (especially in depicting Nightmare Nurse's demon form). But, by and large Guinaldo's art lacks the edge that Dark needs (and that Janin brought), depicting everything too straightforward and brightly. I'd hoped the Deadman story might result in a new costume for Deadman, something I think is badly needed; it did not, and also Guinaldo draws Deadman's circus collar as a kind of halo around his head, which added to its rather dated look. The book ends with a Futures End tie-in by DeMatteis with Len Wein. Acknowledging Wein's contribution, the issue could be read as kind of a one-off House of Mystery-type story, in which the Dark encounter a mysterious man out in the void, he turns out to be possessed by a demon, and then in the gruesome twist they save the man but cut his head off just to be safe. But even with the future setting (and even, I'm glad to see, with DeMatteis getting to use Phantom Stranger's Cassandra Craft one last time), it's once again a Justice-League-Dark-fights-creatures-from-the-void story, essentially the same as the two origins. Also, after Demon Knights spent so long setting up a relationship between Madame Xanadu and Etrigan the Demon, the writers' choice here to pair the future-Zatanna with Etrigan comes off as poor research even despite the "five years later" jump. 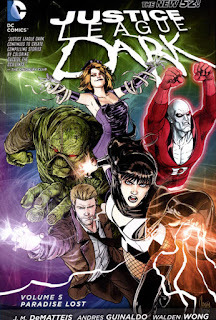 Were Justice League Dark Vol. 5: Paradise Lost not the last volume, I might very well think twice about continuing; this is a book that didn't actually start that strongly, but that picked up in the middle and had a good couple volumes -- Justice League Dark Vol. 2: Books of Magic being the best -- but that's faltered. Only that DeMatteis has one more volume left -- and that it seems to star a pretty wide swath of Justice League Dark characters past and present -- will bring me back for the finale. Yes, for Deadman, all is explained (and very well) in his Secret Origin story, from the Secret Origin #6 single. Collected in the second volume of the serie. Also, I agree on what you said, even if I kind of like it either... Since there's wasn't Phantom Stranger anymore (that I totally loved)... And I think the Vol. 6 is better. Glad to hear Vol. 6 is better; I'm looking forward to reading it as the conclusion to a series I've very much enjoyed at times. Thanks for the tip on Secret Origins; I wasn't too keen on the first book, but maybe I'd have to check out the second one for the Deadman clarification and others.